Level 8 Craftling: Creeper Plushie Giveaway! Hi, everyone! I am participating in Giveaway Day with two giveaways this week! After checking out my giveaways, go to Sew Mama Sew to see the many other giveaways. This giveaway is for a Creeper Plushie! I made it entirely by hand and filled it with really soft pillow stuffing, so it is really wonderfully soft and squishy and I almost don't want to give it away (I might make another for myself later). The middle is also perfect for a pillow! It is hand sewn, not machine sewn, so there is the occasional puckering of a seam, but it's still pretty adorable. The face is black fabric that is sewn around the edges with green thread. On to the pictures! Too close! It will explode! Ah!!! And yes, this is me, the maker. Who can enter? Anyone in the United States or Canada. International shipping is too expensive for me right now - maybe another year! How can I enter? Leave one comment before Friday, May 25th at 5 pm PST (8 pm EST)! If you are a Minecraft player, your comment should answer one of these questions: What is your favorite Minecraft build (feel free to link to pictures! ), or What is your favorite thing to do in Minecraft? If you are not a Minecraft player, let me know why you're interested in the plushie (your kid/partner/friend plays, etc). I will pick a random comment to be a winner with a (mostly) random number generator. By "(mostly) random" I mean this: If I get a fair number of responses from people who either are Minecraft players themselves or want this to give to an avid Minecraft player they know, those people will have preference over those who have no idea what Minecraft is and just think the plushie is cute. I am choosing the winner this way because I think that there is extra joy in knowing the meaning behind something, and I believe a Minecraft player will be able to enjoy this plushie a lot more than a non-Minecraft player (omg! I'm hugging a creeper that won't explode! Haha! - that kind of thing). Please do comment if you don't know what Minecraft is, though, and would still like the plushie - you never know, you could still win. You said two giveaways. What else have you got? 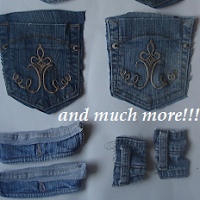 I am also giving away parts of jeans (includes pockets, belt loops, metal zippers, etc).